on Netflix around the time my ex-husband left, and as silly as it may sound, I learned an important lesson from the show that I'm still grateful for. It must have been the first or second episode, just after the plane crashed on the beach. Jack recounted a time when he was full of fear just before he was to perform a risky surgery. He was given the advice to feel the fear in all its intensity for one full minute, and then let it go and move forward. He took the advice and after allowing himself to feel the fear, he was able to let go and focus, successfully performing the surgery at hand. I've found that to be helpful advice when faced with fears, doubts, disappointments, sorrow, anger, etc. Instead of rejecting the feelings and trying to make them just disappear, I've learned to allow myself to feel these things, even feel them deeply for a time, and then I'm able to surrender the feelings and let them go. I used to pray for God to take my feelings away. Now I let myself feel them and work through them. Instead of asking God to take them away, I ask Him to heal me. I tell Him how I feel, even when it isn't pretty (He already knows anyway). He created us and He gave us emotions. They're not wrong, even if we see them as negative. They're just evidence that healing needs to take place. So now when I'm sad or frustrated or feeling defeated, I feel it. And I pray through it and sometimes talk it through with someone I trust. And then I let it go. 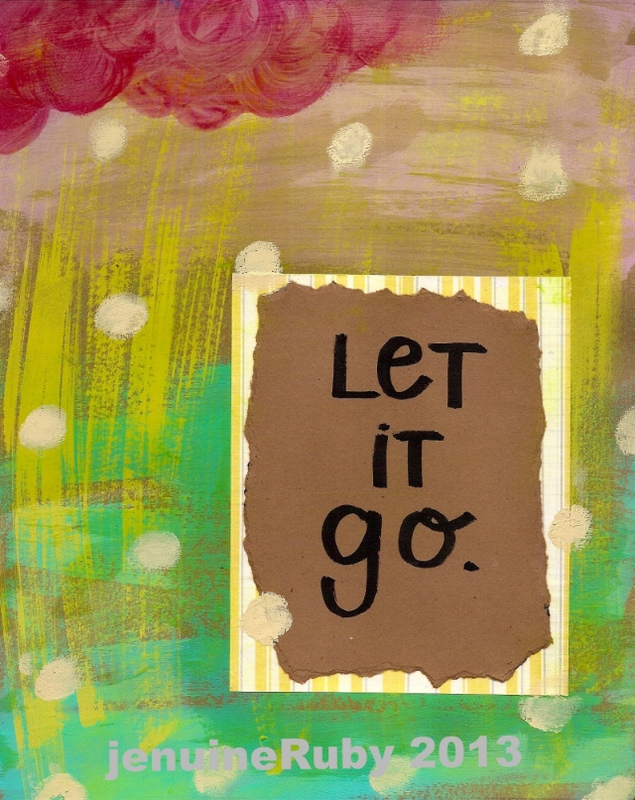 It's so important to let it go after feeling it, because if we don't, it will turn into bitterness. I can feel anger, but I don't want to become an angry person. I can feel sadness, but I don't want to become depressed. I can feel hurt, but I don't want to stay there. I want to move forward into healing. Sometimes I may feel like I've failed, but that doesn't mean I'm a failure. I'm a work in progress as long as I don't get stuck in those feelings. Sometimes things happen that are just not fair. It's ok to feel that way... and then let it go. Sometimes people hurt us. It's completely normal (and even good, in my opinion) to feel all the emotions that come with being hurt. But instead of acting and responding in those feelings, we can pray through them and let them go. We can ask God to transform those feelings into compassion and pray for the one who hurt us. It's easier to write about than to practice, but with time it gets easier and can become a natural response. Sometimes we blow it. This one is hard for me. I'm hard on myself and tend to feel like a failure. But that's not truth. I can feel the regret and remorse, but then surrender those feelings and ask God to remind me of truth. Then I can let it go and move forward. We can't move forward when we're wallowing in self pity or anger. Our feelings may be warranted and they're always valid, but they have to be temporary so they don't control us or change who we are and how we respond to things. Sometimes it helps to have something visual to help us remember things that God is teaching us. This is what was on my heart when I painted this. Your feelings matter. They are valid and they are often justified. But if you hold on to them, they'll make you ugly from the inside out. Let it go. Surrender it to the Lord and He will replace your sorrow for joy, your mourning for dancing, and your fear, anger and worry for peace.